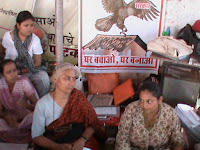 In what is being interpreted as a victory of sorts for well-known social activist Medha Patkar, the Ghar Bachao Ghar Banao Andolan (GBGBA) of Mumbai, which she leads, has taken “assurance” from the Maharashtra government not to forcibly evict slumdwellers in order to safeguard the mangroves next to the sea shore. The "assurance" was given by state forest minister Sudhir Mungantiwar, who met Patkar along with her colleague Bilal Khan and representatives GBGBA living in the slums Uday Mohite, Shriram Rjbhar, Mauluddin Hawari and Rehmat Sayyad. The meeting, which took place on Wednesday, was fixed following slumdwellers' protest against the massive demolition drive carried out by the Mangroves Cell of the Maharashtra Forest Department next to the mangrove areas in Mumbai and Navi Mumbai. Around 4,000 families have been evicted by the cell so far, and plans were afoot to further evict around 1,500 slumdwelling households by May first week (click HERE). GBGBA delegation told the minister the Mangroves Cell was all set to evict around 700 families after April 23 in Cheeta Camp and 800 in Bheemchhaya, Vikroli, Kannamwar Nagar in the first week of May. The delegation apprised the minister about the “agony” suffered by the evicted slum residents after they were rendered homeless and how it would affect more in case the demolition drive was carried out. Pointing out that the evicted families had not been provided with any rehabilitation package, the delegation said, the eviction is taking by wrongly interpreting a Bombay High Court order of 2005 regarding protection of mangroves in Mumbai and Navi Mumbai. The Mangroves Cell was especially misusing the court ordered to declare mangrove areas and the area in the buffer zone of 50 metres as ‘protected forests’, disallowing all construction activities in such areas. It said, the Mangroves Cell woke up about the order 10 years of the order, evicting slums near the mangrove areas in complete violation of the Indian Forest Act, 1927, which contains a full procedure of settlement of rights of the people living in forest areas. “On the issue of mangrove trees destruction, which was pointed out by Medha Patkar through a report, the minister directed his department to start a helpline number to register complaint of mangrove destruction and to evolve a system for taking firm actions on the complaints”, the statement said.